Good-bye home, Hello New Hampshire! Mmmmmmmmmmm. Also tomato sauce that I put up last summer. This soup tasted like spring! I have also been enjoying my sewing room. I am hard at work on projects that I can not talk about, but I promise to share as soon as I can. I loved every minute of my time at home and I am officially recovered from my trip to Australia. I am ready to meet some of my favorite quilters at Bits 'n Pieces in Pelham, New Hampshire this weekend. Will I see you there? Liz told me that she has a surprise for me. Should I be afraid? If you can't make it to Bits 'n Pieces, check my teaching calendar. If you aren't able to take an in-person class with me, check out my Craftsy class. I spend a lot (too much?) time on Facebook and reading blogs and you know how sometimes people are all saying the same thing? Lately, I've been reading a lot of "I like that people show me how to quilt on video, but they only quilt on little squares and not big quilts" type comments. So, I basted up a quilt and moved my video camera away from my table for a wide shot of how I flip and fold and move a quilt while quilting. I don't give any instruction in this video, nor do you see the pattern that I am quilting. If you are curious, I am doing some continuous curve with an oval template and then some free-motion ribbon candy designs. You do, however, see my Cheezit fabric finally used in a quilt. I bought it a few years ago because Cheezits are my absolute favorites! I didn't know what I was going to do with it, but it is 60% of the back of this quilt and I am so in love with it! If you wanted to see how a large quilt is manipulated under a machine, I hope this helps. If you have no interest in that, I hope you enjoyed the Cheezit fabric! Odd that I just returned home from a trip to Australia and I was ready to make the Sydney block in Pat Sloan's Globetrotting block of the month from 2014. I have never actually visited Sydney, but I've transferred through their airport many, many times. This block is a tad darker than my other blocks but I think it will give some depth and balance to the quilt. I can't wait to make the pink version! Swanky from Chez Moi from Moda worked perfectly! I hope this family remembers my love and respect when they use their quilt. Aside from arriving at a foreign destination, the high point of the actual travel day is watching movies. I rarely watch movies at home; I listen to old favorite movies while quilting instead of watching new movies. Coming home from Australia, I watched shockingly few movies. It was a WWII movie starring Brad Pitt and Shia LaBeouf. I love WWII movies so I am biased, but this was pretty good considering I watched it while it skipped and dissolved on my lousy seatback monitor. I wish I could say I watched the Imitation Game. I dozed through the movie and the monitor stopped working when I tried to replay it. I will definitely get this from the library and watch the whole thing some time. I've seen this before and liked it, so I watched it again. Thank you, Canada. I dozed through this one but got the general idea. Who isn't in this movie? Leonardo DiCaprio, Matt Damon, Jack Nicholson, Mark Wahlberg, Martin Sheen, Vera Famiga, Alec Baldwin, Mark Rolston, J. C. MacKenzie, and more. Spoiler alert: Everybody dies. OK, not everybody, but you get the idea. I currently have no overseas trips planned, so I'm not sure when I'll watch another movie! One of my favorite things in the world is to hang laundry on the line outside. No, I'm not kidding. Yes, I too have heard that medication could help. I am now home from Australia, my body is almost back in the western hemisphere, I have a suitcase full of dirty clothes, and it's April. I'm obviously going to wash all of those clothes and hang them on the line. Wait! Where are the clothes? IT WAS SNOWING, Y'ALL!!! In April! On my clean clothes! I am a terrible photographer and couldn't get the falling snowflakes to show up on the iPhone. They were really cool snowflakes, by the way; they were like little styrofoam pellets. Odd. Since laundry isn't my favorite thing this week (stupid snow! ), I will have to talk about a different favorite thing: thread. DecoBob from WonderFil especially. I love this as a bobbin thread for quilting, in the needle and/or the bobbin, but I want to love this as a piecing thread. I never did. Like I said: not love at first piece. Have you tried DecoBob thread yet? Are you in love? I am blessed to have a job that I love which also routinely introduces me to new people, places, and experiences. My recent experience going to Australia was as uneventful as it could be. My time in Australia could not possibly have been better. My journey home from Australia? Well, I landed safely each time. That's HUGE, but it is also the only good thing about that 40 hour journey. 8:00 am Melbourne time: was informed that there was no possible way to leave Melbourne that day. Prepared to stay for a one-day holiday and maybe go to the zoo. Koalas and kangaroos? Sign me up! Had to wait for hotel and taxi info. 9:45 am Melbourne time: was informed that my flight to Aukland was booked and I had 15 minutes to reclaim luggage and check in. Then I had 15 minutes to get through security/passport check and run to the farthest gate of the international terminal. 10:00 am Melbourne time: check in for flight. Discover that I had sliced my finger while retrieving luggage. Left a huge puddle of blood at the check-in desk. Tried to mop the blood from both arms (how did I do this?) and not look like a serial killer while going through security screening. I guess I succeeded. 10:15 am Melbourne time: boarded my plane huffing, puffing, and sweating. Discover that I was in the middle seat for a 3 1/2 hour flight. My worst nightmare in a "first-world problem"sort of way. (I lost track of time after this). My left seatmate was a delight, but my neighbor to the right? He was a frustrated percussionist and did his Ringo Starr impersonation for the entire three hour flight. I was elbowed every few seconds. In frustration, I elbowed back and claimed the armrest. I have never done this before. VICTORY!!! As my elbow was repeatedly assaulted for the remainder of the flight, I will admit to shedding several frustrated tears. I was going to another country without any tickets for future flights. I had no cell phone or computer access to figure out where I was going. No one on earth knew where I was. I flew Air New Zealand to Los Angeles. I was seated in a window seat (Praise God!) but my seatmate was a hyperactive mom. Her daughter in the aisle seat was very well behaved, but the mommy needed to be told to sit still. For twelve hours. T w e l v e H o u r s. And the movies didn't work. I didn't cry, but I wasn't having much fun, either. Landing in Los Angeles and turning my phone back on? It was pure joy! I felt in control of my trip again. I still didn't have a ticket for my next flight nor did I know when/where it was taking off, but I was in the States and I knew that I would make it home eventually. At passport control, I used an automated kiosk and it printed out a receipt with my photo on it. One should never have a photo taken 23 hours into their travel day. It wasn't pretty. I rechecked my luggage and the kind man told me that I should go to Terminal 5 by turning right outside the door. I walked along a narrow sidewalk outside LAX under the departures platform breathing car exhaust. I had no luggage (again, Praise God!) but most other people did so I kept tripping over them until I passed Terminal 4 and entered Terminal 5. I checked in. Finally! A ticket!!! I made it through security for the 4th time during this odyssey and discovered that my flight was actually in Terminal 6. This time I walked underground. I never minded the distance. Stretching my legs after all of those hours on a plane was glorious! I grabbed some lunch and made it to my gate with a few hours to spare. I volunteered to give up my ticket if necessary. They would have put me in a hotel room with a bed and a shower and then flown me home in the morning. How lovely would that have been? Alas, they didn't need my ticket and I sat in my window seat (Praise God!) for the 5 hour flight home. My middle seat-mate was in a band from Mexico and the young lady in the aisle was petrified of flying. We landed in bad weather (bumpy, oh so bumpy for the last hour) so I spent the last part of the flight reaching around a sleeping musician to hold this gal's hands and talk her down. The poor thing was shaking with fright! We landed at JFK only 10 minutes late. Whee!!!! I called my sweet hubby and told him to go to sleep and I'd be home in 2-3 hours. Oh how foolish I feel about that now. They didn't have a gate available for us so we sat on the Tarmac for a while. Eventually, we deplaned. While waiting for our luggage in the wee hours of the morning, we were informed that the luggage ramp was closed due to a lightning storm. Of course it was! Eventually I got my luggage and got on the shuttle to the off-site parking lot. At 2am, the shuttle got a flat tire while I was on it and we were stranded on the side of the road until another vehicle could come to take us to our cars. My shuttle mates had difficult trips with 2-3 hour delays from Orlando, San Diego, and San Francisco. 10 hour delay, starting in Australia. I win so be quiet! The replacement shuttle arrived and I think it did double duty at the Fulton Fish Market. Oh the stench! I was afraid fish juice was in the seats and would stay on my clothes. Fortunately the smell stayed in the van and didn't follow me home. After all of these hours, I smelled bad enough without reeking of fish! I eventually got to my car and drove home slowly, first due to JFK traffic (even at 2:30 am) and then due to the heavy rains. I made it home by 4am. HOME! Hubby was awake, wondering where I was. He helped me unload my bags and then fell back to sleep. I got some food, got a shower, and was asleep by 5am. Time elapsed between beds? 40 hours. Woke up to my alarm at noon. Could have slept longer but needed to adjust to NY time. Did a little computer work and went back to bed at 11 pm. Woke up today and am as right as rain. I love that I don't suffer from jetlag once I'm home. I get good sleep in my own bed and can reset my clock very quickly. It takes a few day for me to start being hungry at the right time of day again, but that's easy enough to deal with. I will spend 10 days at home before heading out again, this time to New Hampshire. NO PLANES INVOLVED!!!! So, that sounded a lot like whining. I didn't want to write a whiny story but I've received countless emails asking about my adventures. I relented. These ladies were in my 2-day class. Some of them took a third day with me and some took all four. One has taken all 12 days of classes that I have taught in Australia. Such a dear! If you want to take a class from me and live closer to me than Australia, you might find a city near you on my teaching calendar. 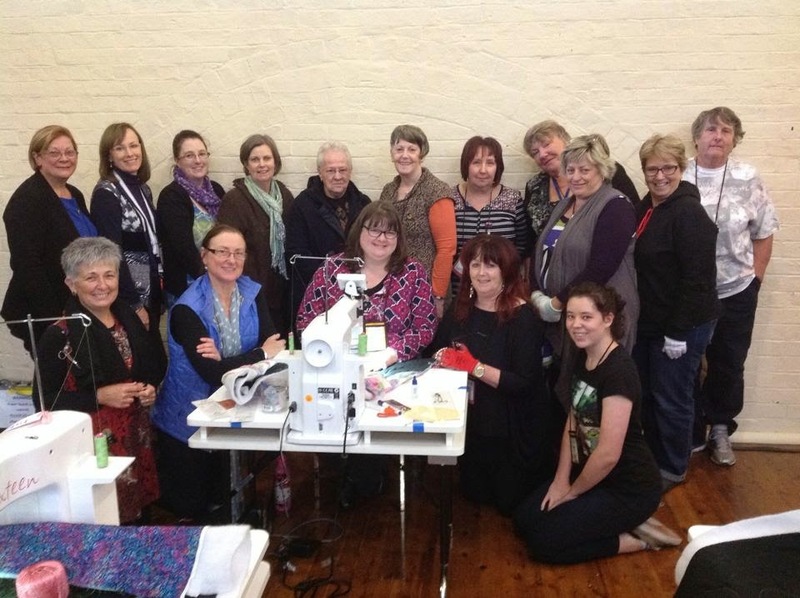 If none of the locations/dates work so that we can meet, check out my Craftsy class. Remember, Craftsy = the place where you always win the armrest war! After a long, Long, LONG trip home from Australia, I was tickled to open my mail and see the latest Modern Quilts Unlimited magazine.If you turn to page 22, you will see my quilt! I do believe that this is the first quilt pattern of mine to be published in a magazine and I am tickled pink! The pattern is called Dedication and is inspired by a Luis Sacilotto painting I visited at the Museum of Fine Arts in Houston during a rare day off from Quilt Festival a few years ago. The fabulously talented Mandy Leins also has a quilt in this issue. If you are looking for a take-along hand-piecing project, check out her Strawberry Moon quilt! Now that I'm home for a few days adjusting to the western hemisphere, I hope to quilt my copy of this quilt pattern; I always make two copies of a quilt when I test a pattern. I plan to use ribbon candy quilting (of course!). If you liked the ribbon candy quilting on my quilt in the magazine, I teach how to do that in my Craftsy Class. I've finished all of the qiulting on block 6 of my 2014 Pat Sloan block of the month. Whee!!! I hope to finish this 2014 block of the month before the end of 2015. It's good to have goals. I was never convinced that this plan was a good one, but I let it work itself out in time. I think I like how those triangles turned out, after all! 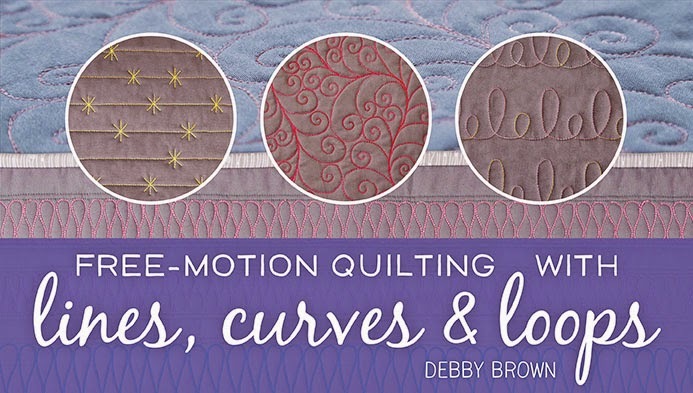 I have a new Craftsy class all about free-motion quilting. My people have an inclusive definition of "family." If you are my dad's Stepmother's sister, you are in. If you are my husband's uncle's wife's daughter, you are in. I just made a quilt for my son's niece. If she calls him "uncle," that makes me her "great aunt," right? I made it for my Craftsy class. When Charlotte gets older, I'm going to quiz her and see if she can find all of the butterflies. I just returned from packing up my classroom after my last day at AQC in Melbourne, Victoria, Australia. I'm sad to see it come to an end. So if I drink a lot of this "skinny" milk, I'll be skinny? Is that a promise? She is an absolute delight and love the American flag fabric on the back of my samples. I have a fairly good idea of who I should blame for these shenanigans. Cough*Gary*Cough. If you are wondering what happened next, all I can say is "What happens in Australia stays in Australia." So long, my Australian friends. I will think of you fondly during all 31 of my travel hours tomorrow and for weeks to come. Ok, I lied. Traveling isn't always fun. Early this week I flew from New York to Los Angeles to Sydney to Melbourne. That is about 25 hours of in-fight time and was 36 hours of actual door-to-door travel. Does that sound like fun? This Tom Cruise movie was War of the Worlds meets Ground Hog's Day. I had never heard of it but it wasn't terrible. I had heard of this movie, but I didn't really know much about it. Again, not terrible. Another movie I had never heard of, and now I really want to read the book by P. D. James to see how the story was intended to turn out. I've read all of the books and now I've seen the latest movie. It is interesting to see the books on screen. They are different than they were in my head, but I'm willing to see the last one. Christian Bale as Moses. Um, no. I have to reverse this trip on Monday and am not looking forward to that, no matter how many movies I get to watch! These lovely folks might just make me look forward to another 50 hours on an airplane! Life at home continues without me, though, and I am trying to keep up with it as best I can. One of my happiest notes from my real life is that my Craftsy students are posting photos of their quilting projects on the Craftsy platform. They are doing so well! I guess it's a good thing that I have awful flights to look foward to; otherwise, I might believe that my life was too perfect! As I've been struggling with jetlag, living 14 hours ahead of my husband, and constantly asking myself "What time is it, really?" I have had the "why do I do this to myself?" thought more than once. And then the quilt show starts and I remember why I volunteer for this abuse again and again and again. If you can't read the writing on the tool box, it says "Touch my tools and die." Enlarge the photo to get a close-up of her quilting. I'm totally stealing her design. I am looking forward to my Friday class where we will rock the ribbon candy designs in class... all day long! 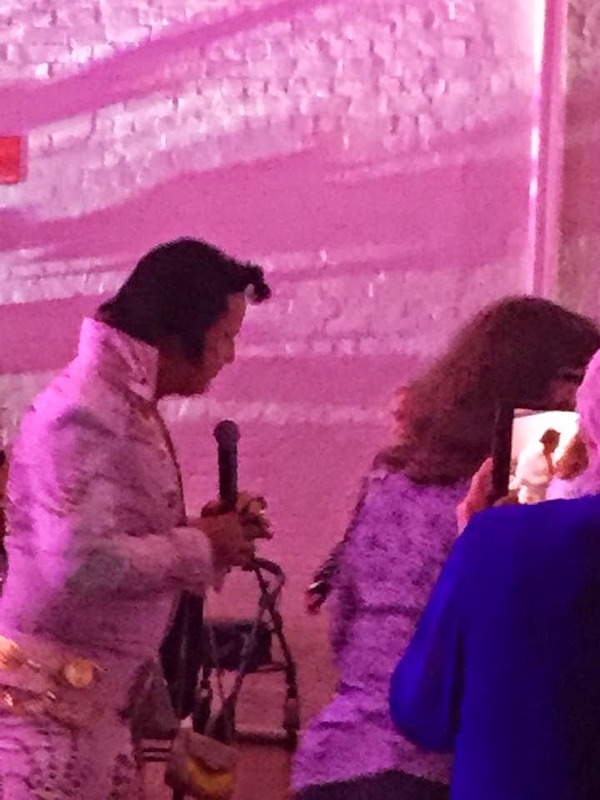 If you missed the cocktail party at AQC last night, you missed my grand entrance to R.O.C.K. in the U.S.A. In other years they've used Born in the USA and other national tunes. It's always fun to see what music Gary picks for his international introductions. You also missed watching me dance to Hooked on a Feeling. If you know me at all, you know that missing seeing me dance was a blessing. Bacon-onion-tomato pizza with all ingredients fresh from the Queen Victoria Market. You missed the pizza, too. It's amazing what can be cooked in a hotel kitchenette! I can't wait for my first day of classes. I met up with students from previous years at the party last night and now look forward to meeting my new students! I have a confession to make: I am addicted to Cutie Quilts. Those pretty fat-eighth packs of fabrics just drive me wild! I used the leftover bits from this quilt. I adore Fig Tree & Co. fabrics! 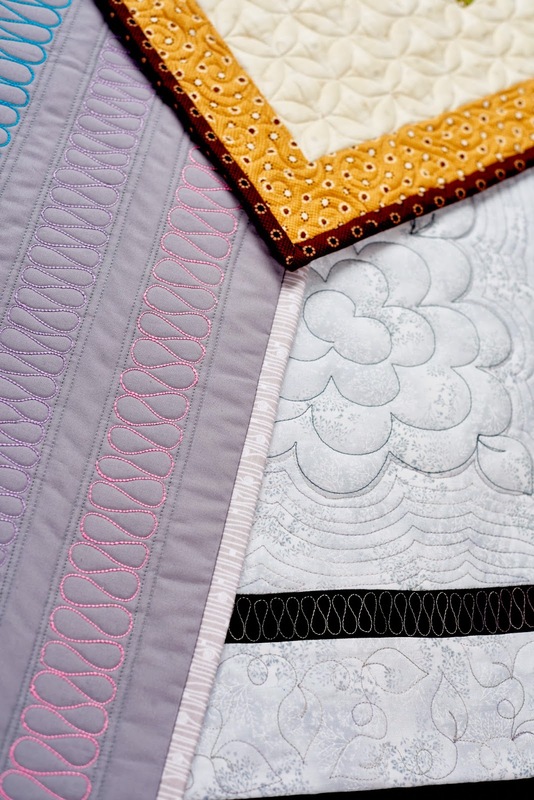 If you've ever taken a class from me, you know that I love quilting with ribbon candy. This quilt is perfect for ribbon candy quilting! I'm keeping this quilt as a working sample, but I'll probably have to pet it regularly. If you like this quilt pattern, it is only one of the patterns I have designed for the Cutie Pattern line. If you liked the ribbon candy quilting, I teach how to do that in my Craftsy Class. I finally finished quilting block 6 of Pat Sloan's Globetrotting block of the month! I like my Plan B and will keep it on my quilt. Sometimes, quilting is a process. Be sure to sign up for my mailing list on the sidebar of this blog. I have more good news on the way and you'll read it there first! Quilt of the Week -- Sweet Tooth! Today I am on an airplane, and I do mean today. All day. I got on a plane last night and will get off the plane on Tuesday morning. Overseas travel is so glamorous. Zzzzzzzzzzzzz. This is a sample from a retired quilt pattern. This quilt is now going to live with a friend undergoing chemotherapy. I hope she feels hugged whenever she uses this quilt.